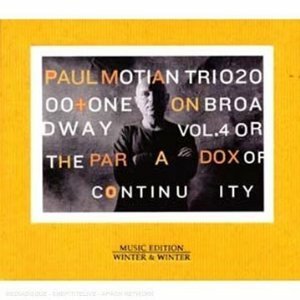 Since 1988, Paul Motian has recorded twenty-one albums with a variety of players – his trio with Bill Frisell and Joe Lovano, Tethered Moon with Masabumi Kikuchi and Gary Peacock, work with Geri Allen and Charlie Haden, the Electric Bebop Band, and Trio 2000+One (all available on Winter & Winter). Now, in 2006, Paul Motian celebrates his seventy-fifth birthday! On Broadway Vol. 4 or The Paradox of Continuity (his twenty-second album for Winter & Winter) is a very special musical gift. Motian has dedicated his whole life to music, and this album is the quintessence of his work. The great art of variation and improvisation is the great art of Paul Motian: he unravels themes, rhythms and harmonies, reducing, denaturing, and creating new things that come so close to innermost origins that unsuspected aspects of these hits are revealed.